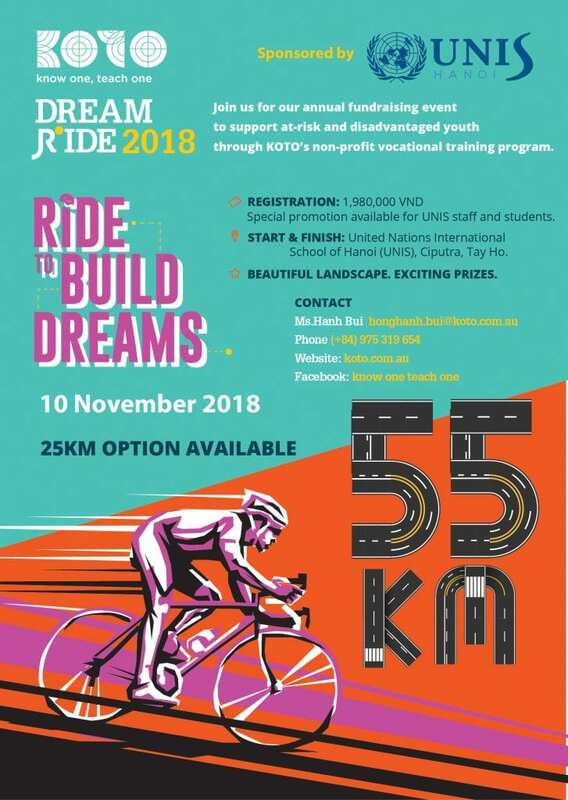 UNIS Hanoi is proud to continue this year sponsoring the KOTO Dream Ride, which is an annual bike ride to raise funds to support at-risk and disadvantaged youth through vocational training. The race will take place on Saturday, November 10 and this year will once again start and end right here at UNIS Hanoi campus! This is a popular event with our with our staff, faculty, students and parents and we encourage you to join the fun for a good cause. Click here to register. For your convenience, KOTO Dream ride registration payment can be made at UNIS Hanoi for our community members. Please see Ms Linh at the reception desk in the Administration building (B7) on weekdays from 8.00-12:30 and 13.30-17.00 to pay after registering online with KOTO.